In addition to its big towns and cities—London, Edinburgh, Oxford and Cambridge—the UK has a host of other world-class attractions. We highlight three of them here: Stonehenge (the world's most famous prehistoric site); Henry VIII's Hampton Court Palace; and the modern Eden Project (the world's largest greenhouse). Stonehenge, a burial site at the centre of which stands an iconic lintelled stone circle, is the world's most famous prehistoric monument. The earliest parts of Stonehenge, an earth bank and ditch enclosing a two-acre grass circle, date from 3000 BC. The bank is made from Seaford chalk, with deer and oxen bones found at the bottom of the ditch. Inside the bank are 56 pits, known as Aubrey holes after the 17th century antiquarian; they have a diameter of about 1 metre and are thought to have held standing timbers which have since decayed. The site's famous stones were added in around 2500 BC. The large stones which make up the lintelled circle are known as sarsens, and are about 13 feet high and 7 feet wide, with an average weight of 25 tonnes. They are believed to come from a quarry on the Marlborough Downs, 40 kilometres north of Stonehenge. The smaller stones are known as bluestones, on account of their colour when freshly cut and when wet; they come from the Preseli Hills, in south-west Wales, some 150 miles away. Speculation abounds as to the precise uses of Stonehenge. It is clear that it was used as a cemetery, as the site contains the remains of hundreds of burial mounds, but it may also have been used for Druid or ancestor worship, as an astronomical computer to predict the movement of the heavens, or as a place of healing. 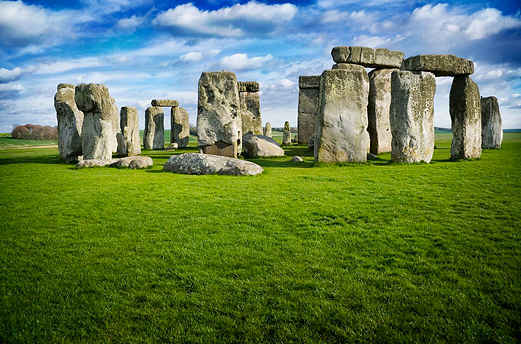 Stonehenge was awarded world heritage status in 1986 and is a major tourist destination. where? Off A344 Road, Amesbury, Wiltshire - SP4 7DE (about 13 kms north of Salisbury). when? Daily from 9.30 am to 4 pm (later opening in summer). Closed 24 and 25 Dec.
£$€¥ Adults: £7.50; Concessions: £6.80; Children: £4.50. Hampton Court is a palace located 12 miles to the south-east of central London which was inhabited by the royal family between 1529 and the 18th century. It has a rich and varied history: first constructed for Cardinal Wolsey, the palace was given to King Henry VIII in an attempt to curry favour; thereafter it was the birthplace of Henry VI and the place where Henry VIII's third wife, Jane Seymour, died a few weeks later; it was here that King James I commissioned his eponymous version of the bible, and where King William fell from his horse in 1702, sustaining injuries which would prove to be fatal. The Palace is built in two contrasting architectural styles: Tudor and Baroque. The former style is exemplified by Anne Boleyn's Gate, adorned in 1540 with an elaborate royal clock showing not only the time and date but the star sign and the high water level at London Bridge (important for those travelling to and from the palace by barge). The Baroque sections of the palace were added during the reign of William and Mary in the late seventeenth century, following plans drawn up by Sir Christopher Wren which are thought to have been heavily influenced by Paris' Palace of Versailles. Visitors can explore the Palace's impressive state rooms, banqueting hall and kitchens, along with significant works of art (including Mantegna's The Triumphs of Caesar), royal furnishings and a large collection of arms in the King's Guard Chamber. The Palace's Royal Chapel is another important feature, famous for its stained glass and brightly-coloured gothic vaulted ceiling; it was here that Henry VIII was informed of the adultery of his fifth wife, Catherine Howard. The Palace's formal and sunken gardens are another draw. They contain a small banqueting house from c. 1700, a conservatory housing the 100 foot long Great Vine (the largest in the world) and the famous Hampton Court Maze. Visitors should try to pick a good day for their visit. where? 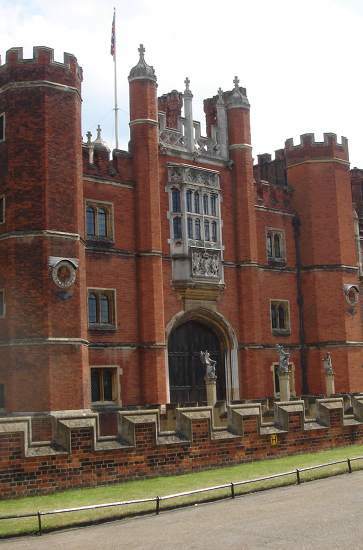 Hampton Court Palace, East Molesey, Surrey KT8 9AU. 35 minutes by train from Waterloo. when? 10 am to 4.30 pm (winter); 10 am to 6 pm (summer). Closed 24-26 Dec.
£$€¥ Adults: £16; Concessions: £13.20; Children: £8. 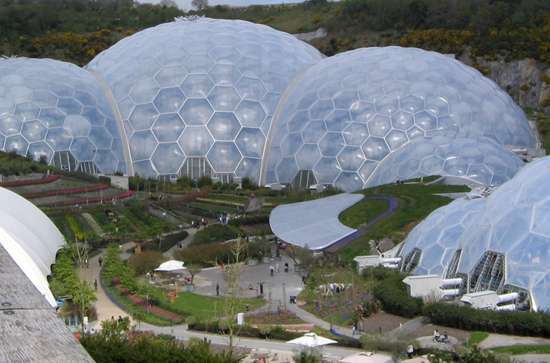 Completed in 2001, the Eden Project is a botanic garden that houses the world's largest greenhouse. Built in a disused quarry, the Project is designed around two huge enclosures made of panes of hexagonal ETFE plastic held in place by a steel frame. The larger enclosure, known as the Rainforest Biome, covers an area of almost four acres, and has a height of 55 metres. It holds a vast range of plants, including banana and coffee trees, cocoa and rubber plants, giant bamboo and Titan arus (the world's biggest flower). The Mediterranean Biome is about 1.5 acres in size, with a maximum height of 35 metres. It holds plants such as lemon, olive and cork trees, vines, poppies and lupins. Other attractions include the Project's outside gardens, which hold thousands of plants (including those used in medicine and for fuel and clothing), and feature numerous sculptures and an enormous climbing frame. The Project's newest edition is The Core education centre, which is packed full of interactive displays to teach visitors about ecosystems, evolution and climate change. Allow at least four hours to see everything. where? Eden Project, Bodelva, St Austell, Cornwall, PL24 2SG, UK. when? 9am to 4.30pm (with later closing times during school holidays and summer). £$€¥ Adults: £23; Concessions: £16.50; Children: £9.50.